The Junior League of Washington has raised millions of dollars for the Washington, DC, metropolitan community over the years. Through fundraising events like Holiday Shops and Tossed and Found as well as Special Event sales, the Junior League of Washington has many ways of serving the community. Want to help? You can make a difference in your community today! 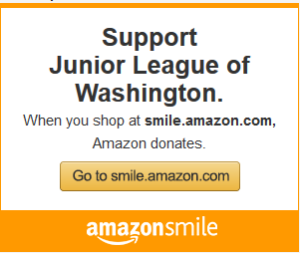 All donations to the Junior League of Washington (through Holiday Shops, Tossed & Found, Resolution Read, and more) support our mission to improve the community through the effective action and leadership of trained volunteers. Help us develop the potential of women, promote voluntarism, and improve the community with your donation. To donate, click here. Thank you for considering a gift or sponsorship. Giving to the Junior League of Washington is an excellent way to improve your community through the effective action and leadership of trained volunteers. To learn more about becoming a corporate sponsor and to review our Corporate Sponsorship Package, click here. We welcome inquiries from corporations; please e-mail us at sponsorJLW@jlw.org to discuss your potential involvement. If you are a federal employee or military member, consider supporting JLW (#17835) through the Combined Federal Campaign (CFC), the world’s largest and most successful annual workplace charity campaign. From September 10, 2018, through January 11, 2019, contribute online at http://www.cfcnca.org, or reach out to your office’s CFC Key Worker. For more information, contact annualcampaign@jlw.org. The Junior League of Washington is an organization of women committed to promoting voluntarism, developing the potential of women, and improving communities through the effective action and leadership of trained volunteers. Its purpose is exclusively educational and charitable. Click here to view our latest annual report.